The Betalyst algorithm has evolved a lot over the past two years in an effort to increase the accuracy of the selections it provides and to help football punters make a consistent profit from their betting. 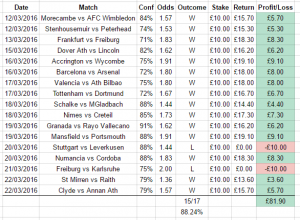 Over the past couple of months I have put special attention into the Both Teams To Score games algorithm as I noticed that these bets tend to have fairly reasonable odds and if you could get an algorithm that could deliver winning tips with an accuracy in the high 80% mark you could make some serious money. The Betalyst algorithm is now delivering an 88%+ accuracy for its top two both teams to score predictions every day. 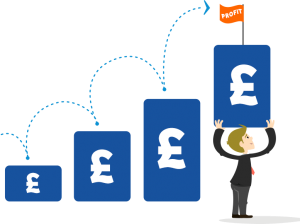 It does not take a genius to work out that accuracy like that can lead to some very strong profit, in fact based on the data taken since 12/03/2016 when the most recent version of the algorithm went live the projections show it could earn £1,700+ profit in month 1 from a £100 starting balance using a progressive staking system. 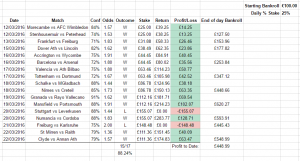 If the accuracy and odds stayed consistent, you would be looking at around £1,600+ profit a month from level £50 stakes. The difference with progressive staking is that over time your stakes increase as you win more bets, so your profit increases as well. Using the data from this algorithm, the accuracy to date and the average odds, I modelled the potential profit that could be achieved in a 60 day period. With a starting bank of £100, you could turn that into £35,000+ in just 60 days using the tips from this algorithm and a 25% of balance staking strategy. What are peoples thoughts on the accuracy of this algorithm? 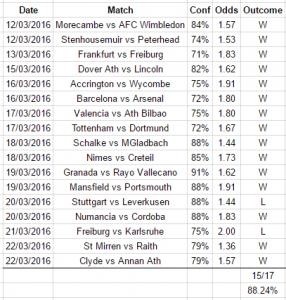 Is there a better staking strategy that can be used?Have you been using the tips for your betting? Share your comments below.